Beatrice di Tenda was a problem child, Vincenzo Bellini an alternately protective and disparaging parent. If he had lived to write another dozen operas this might not matter, but this work of 1833 was his penultimate piece; two and a half years later, the young Sicilian was dead, not yet 34. The melodies of Beatrice thus come from the same rare and gorgeous fount as do those of Norma and Puritani, and if you love her sisters, you should certainly save a date for Beatrice. Her next big date in this neck of the woods comes tomorrow night, when the Collegiate Chorale and the American Symphony Orchestra present the opera at Carnegie Hall. Beatrice has not been professionally staged in New York since the mid-nineteenth century, but concert performances like this one have been memorable: Joan Sutherland made her New York debut in the part at Town Hall in 1961 under the auspices of American Opera Society, an occasion so enthusiastically received that it was encored at Carnegie. (One of her co-stars, a stranger to Sutherland, was an American mezzo named Horne, also making her New York debut.) In 1988, Opera Orchestra of New York revived it for June Anderson. Beatrice is a love quadrangle, not unlike Donizetti’s Anna Bolena (same librettist: Felice Romani; same original diva: Giuditta Pasta, also the first Sonnambula and Norma). Filippo, Duke of Milan, has married Beatrice, widow of a condottiere, so he can get control of her late husband’s mercenary army. But now he’s fallen for Agnese, the mezzo. She, however, has a thing for Orombello, a dense young courtier, who in turn aspires to Beatrice. Beatrice wants nothing to do with him, but the Duke sees his chance to rid himself of his wife. The trial scene is a big Bellinian confrontation, and the prayer trio before the executions is one of the great Bellini tunes. But, this being a Giuditta Pasta vehicle, it doesn’t end there: Beatrice departs to her death but she goes out breathing cabaletta fire. In the cast Wednesday there will be several names to draw attentive voice fanciers. 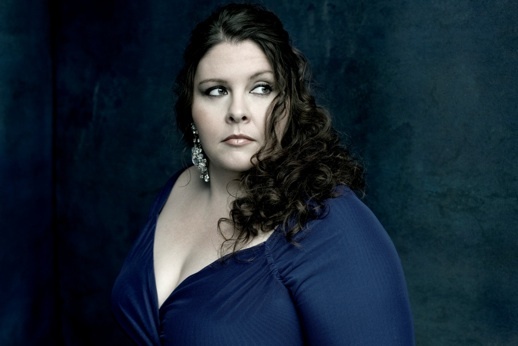 Singing her first Beatrice will be Angela Meade, who has been thrilling in dramatic coloratura roles from Vienna and Wexford to Caramoor and the Met. Michael Spyres, impressive in virtuoso parts by Rossini and Meyerbeer, among others, will sing Orombello. I got a chance to put a few questions to each of them. parterre box: Angela Meade, I’ve had the pleasure of seeing/hearing you sing in Ernani, Norma, Semiramide and Anna Bolena. Would you say that “dramatic coloratura” is your fach? Or would you say they do not fall into such a category? What similar parts, besides Beatrice (and Mercadante’s Virginia – which I heard on the radio and hope you will sing again), are you aiming for, do you feel your voice and style have the particular qualities suited for? Do Mozart’s Countess and Verdi’s Leonora fall into a similar place? Angela Meade: I don’t like to put myself into a box, but most of the roles I sing would fall under “dramatic coloratura.” I have also had great success with roles people would classify as “full lyric”: Mozart’s Countess or Agathe in Freischütz. The parts that I feel particularly well suited for are the great bel canto and early Verdi roles tackled by Sutherland and Caballé. The Countess and Leonora fall into a similar place vocally because I approach all roles I sing with a bel canto technique. A lot, the majority, of what I’ve done has been at major houses and festivals, but among those roles, the general public seemed most drawn to me as the Countess in Figaro, Norma or the Trovatore Leonora. pb: Beatrice was criticized at the time of its premiere as having a story too similar to that of Bolena – a soprano who must die because her husband has fallen in love with another woman (mezzo of course), and therefore entraps her with an ardent tenor. I was very impressed with your acting of Anna, which seemed very personal, very individual. How would you say Beatrice’s story differs from Anna’s? Should the singer aim for different appeal? AM: Even though the circumstances seem extremely similar, the two women are very different. Anna was totally driven by her desire for the throne and ended up in a situation she couldn’t control or reverse. Even though we feel pity for Anna’s predicament and death, we also feel she is just a bit to blame, that she gets what she asked for. Beatrice, on the other hand, is a victim of circumstance. 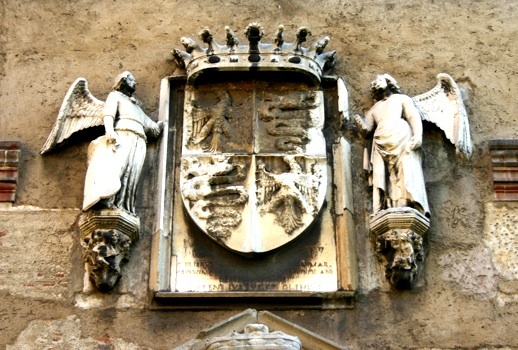 She was happy in her former marriage and when her first husband and only love were taken from her, she felt obligated to marry the duke of Milan. He was marrying her only for her money and power and that he would dispose of her the first opportunity he got. Her music arouses the sorrow we feel for her. pb: Beatrice never seems to “state her case.” She is innocent of adultery and angry at her fate, but we never learn what she does want out of life – unlike Anna, who consciously set love aside and sought the throne. Do you find Beatrice an undramatic story? If so, how, as its interpreter, do you compensate for that factor? AM: I don’t find her undramatic at all. I think her story is even more exhilarating because she does nothing to provoke the attack on her. pb: When the bel canto repertory was being revived in the 1960s, opera companies were cautious about trusting their appeal. The custom then grew up of concert performances of forgotten works, and these have been immensely popular and important. Is it easy to learn complicated roles for just a performance or two? Is a concert performance as rewarding to you, as a performer, as a fully-staged one? AM: A lot of my career thus far has been learning obscure or relatively obscure operas for one or just a few performances (Beatrice, Virginia, Lombardi, Armida, Semiramide, Roberto Devereux, Anna Bolena, even Ernani which isn’t done very often). I love the challenge actually. I think I would be extremely bored if I only sang a few roles. I think it keeps me aware and it keeps me learning and I don’t find it any harder learning a role for one performance than for 20. Concert work is just as rewarding, because if you can still move the audience and stir something in their soul without the help of sets, costumes and staging, then you’ve more than done your job. It is my hope some of the obscure operas will be done with more frequency. Beatrice is a gorgeous score. A lot of people think it’s not staged because the story is improbable, but it’s based in historical fact. If we can stage Anna Bolena, then we should be able to stage Beatrice. 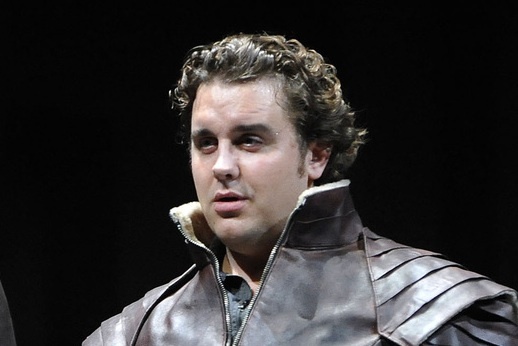 pb: Michael Spyres, I’ve had the pleasure of seeing/hearing you sing Raoul in Les Huguenots, Arnold in Guillaume Tell and Baldassare in Ciro in Babilonia; you have also recently sung Auber’s Masaniello, and you have spoken of Nicolai Gedda, who cut across many repertory boundaries, as a role model. Do you see yourself as more a grand opera tenor or the sort of lighter voice suitable to early Rossini roles? Michael Spyres: To be honest I don’t put much thought into whether I am this type of singer or that type of singer. I always try to interpret the role to the best of my abilities. I also tend not to categorize myself simply for the fact that all of these categorizations came about b.c. (before Caruso) and people’s perceptions about sound and singing are very different than they were in the nineteenth century when these ideas of fach categorizations were formalized. This being said, I do find myself more at home in the bel canto style simply for the fact that one must use every tool in one’s arsenal, i.e. voix mixte, chest voice, mezza voce, and above all. dynamics! Over the last decade every country has had their own idea of what type of singer I am and which repertoire I should be singing, so you can see how hard it is for me to make my mind up on this subject. In Germany I have sung Mozart as well as dramatic Rossini. In Austria I have sung Bach, dramatic twentieth-century German repertoire, Verdi and operetta. In Italy I have sung early music, Mozart, light Rossini as well as dramatic Rossini. In France and Belgium I have sung Mozart, French Grand Opera, Bel Canto, Bernstein and more heavily orchestrated composers such as Berlioz. In the States, I’ve sung Puccini, Donizetti, Rossini, and now Bellini! Everyone has an opinion and a lot of those opinions are correct when put into the correct context. pb: Do you alter much in your technique when you address Raoul, say (or Vasco da Gama), as opposed to a lighter bel canto part such as Orombello in Beatrice di Tenda? MS: Technique is a bit too broad a term for me. Different roles always come with different demands for the voice since virtually every role was written with a different singer in mind. The only changes in vocal emission one must account for while switching between repertoires is to calculate the proper amount of stamina when singing the extremely demanding roles. I spend a lot of time calculating how much of the role is written within the mid-range tessitura and I adjust accordingly by singing fortissimo sparingly. As a singer one must always strive for the most healthy and properly produced sound at all times. Vocal affectations and colorations should only be used in very specific moments and then only for a dramatic effect (such as the “hook”) and never as the rule of thumb. pb: Do you feel the bel canto composers have special things to teach about the art of singing, the use of vocal resources for dramatic effect, that would impress a modern audience or help a singer in performing the music of later composers? MS: Absolutely! More so than any other time period, the composers within the bel canto era understood that the repertoire lent itself to the live drama as the audience and performers became intertwined with these seemingly superhuman vocal demands. The singer is totally exposed and cannot hide, and thus is forced to show you the audience all of their cards. To be fair though, Bel Canto composers were very good at acknowledging vocal capabilities and they adjusted their orchestration accordingly. Even towards the latter part of the nineteenth century, composers such as Verdi were meticulous in their insistence on dynamics. For instance Verdi would write five f’s as well as five p’s in a score. Once you study this and put it into context you understand how much of a master he was in his knowledge of the human voice, because not only does this type of orchestration and vocal writing lend itself to healthy singing but it also helps keep the listener engaged with the ebb and flow of the vocal line as well as the drama on stage and within oneself. Singers and audiences alike have become lazy and bored with bel canto and the art of singing has taken a back seat to volume. Being loud is now the goal and this has overshadowed the essence of why opera exists, to be intellectually stimulated and transported to a different world, to have all your senses caressed, not for someone to stand with a bullhorn like an doomsday preacher on the corner that entertains us for a minute or so. Don’t get me wrong! I do believe that volume is important within operatic repertoire but often opera singers nowadays sing only forte and it is just a way to mask a poor technique which is conversely found within most early music singing where there is a tendency to never sing with one’s fully supported voice and thus singers reserve themselves to using falsetto. Listen to singers of the past who had extremely ample volume but equal artistry. I challenge anyone to hear the recordings of Caruso, Pertile, d’Arkor or Melchior and tell me they sang like our modern “technique,” which is a forced low larynx shout that allowed them to only sing forte! Just because one can sing loud doesn’t mean you have to all the time. pb: Of course bel canto should be sung differently from later music, and with so much smaller an orchestra to “cover” the voice, a great deal more of the work depends upon the singer. Should it be listened to differently? Staged differently? MS: You’ve brought up an interesting point. I believe bel canto should be listened to in a different way than, say, Puccini or late Verdi. One should not expect Verismo frequencies nor the volume of sound that came later. Also the acting style and the sheer drama needs to be taken in context. Bel canto was a transitional period and was heavily censored so they were many more constraints on the topics and characters involved. No longer were operas about gods and demons and the heavens; this was a time of transition to having demi-gods such as kings and queens, and this gave way to verismo which turned us everyday humans into the center of the drama. Staging should always be first and foremost acoustically mindful. I don’t agree with the standing still method of singing and acting. Bel canto lends itself to movement of the body. Of course there are moments one must remain idle because of the vocal demands, but they are few. An analogy for bel canto and verismo is of when the electric guitar came about that can bathe our ears with glorious sounds never heard before; now who would ever listen to an acoustic band with the same mentality as an electric band? We must take the responsibility to listen differently as well as have different expectations within the context of each music. pb: As a character, Orombello comes off as a rather brainless figure, lacking the personality of the three other leads. He seems to have no inner life. How do you, as an interpreter, make up for a character who might not be dramatically sympathetic? Do other Bellini roles attract you, as figures you could make more of? MS: As I said before, it is all about context. At first glance Orombello does come off a bit daft, but this is done for a reason. Characters such as these are much like those of commedia dell’arte or even the ancient Greek theater, because while they as individuals might not be that interesting each character fits within the puzzle piece of the larger dramatic work. If every character was exceedingly complex then the larger dramatic theme would be lost. In Beatrice di Tenda, the entire drama centers around the precious gift of life that is taken away under false pretences. There are only a few hours to fit everything in, and so it is the audience’s job to realize a back story with a character like Orombello. I enjoy this type of drama much more than verismo because it assumes the position that the audience is educated and doesn’t need to be fed every detail about why the character should be interesting. Actually I haven’t studied many other Bellini roles, but I promise I’m not just lazy, as Orombello is the forty-fifth role I have studied! pb: How do singers keep a modern audience’s attention in what is essentially a vocal work without the connecting thread of staged drama? MS: I believe an audience member has to look it as an opportunity to hear some beautiful music and incredible vocal talents that can convey a different type of drama than its staged counterpart. Think of it as an old time radio show where you get to be the director of the film within your mind. pb: Have you varied the “written” music (as was expected of any singer in the bel canto repertory) to suit your particular talents? Whose help do you go to when you are devising ornamentation, or do you work out those matters for yourself? What would say are the particular strong points of your voice that you (like any singer) attempt to highlight? MS: I have made minimal changes to the score because of the character of Orombello. Many people are under the false impression that bel canto is only about vocal fireworks and how many notes one can hit. Every variation should be within the context of the character one is portraying. With this in mind most of my vocal variations tend to gravitate towards featuring my extended range which is typical in the “baritenori” repertoire that I specialize in. I have made up all of my own ornamentation for certain roles and worked with great experts such as Will Crutchfield and Philip Gossett on other pieces. The most fun I had with variations was in a baroque opera, Mazzoni’s Antigono which I performed in Lisbon. I had the pleasure of working with Enrico Onofri, who is a skilled violinist and a baroque expert, and he wrote variations for me that extended from D2 up to F5. pb: What are your thoughts on the rather controversial question of listening to other singers’ recordings when you are preparing any role? MS: I absolutely listen to other singers in fact I am adamant and almost obsessed with old recordings. Recordings have taught me so many invaluable lessons, such as there is no such thing as perfection! I usually listen to live recordings as they are a way for me to judge how the opera should sound. I understand the concern that many people have in not wanting to copy what someone does but that is our job as an artist, to collect ideas and assimilate them and make it new through our unique artistry. I know that a lot of people want to think that they are the first person to come up with a musical idea but the truth of the matter is they have not done their homework, by which I mean listening to every available recording you can get your hands on so you can be sure that your idea is original. One very important thing to keep in mind though when listening to a recording is acoustics. You must realize that live sound is always going to be different than with recorded sound. Recordings are great for understanding practices and getting new ideas about the inanimate object that is the music in front of you. I am very fortunate to have a huge advantage in my voice category simply for the fact that Nicolai Gedda came before me. pb: When the bel canto repertory was being revived in the 1950s and ’60s, opera companies were cautious about trusting their appeal. The custom then grew up of concert performances of forgotten works, and these have been immensely popular and important. Is it easy to learn such roles for just a performance or two? Is a concert performance as rewarding to you, as a performer, as a fully-staged one? MS: Actually this type of repertoire is quite easy for me to learn as it is formulaic. But the devil is within interpretation and the ability for everyone to convey their thoughts in a simultaneous and homogeneous manner. I have now sung quite a bit of bel canto so it is a bit easier for me than someone who is trying out this repertoire for the first time. Rubato can be very tricky! Concert performances are quite rewarding because they allow me to focus on my voice first and foremost, whereas in a staged performance my emphasis is always towards the acting. I believe by doing both concert and staged performances one becomes aware of different sensations and mind sets which leads to a more well-rounded artist—and after all isn’t that what we are all striving for? Photos by Dario Acosta (Meade) and Stephanie Berger (Spyres).